This article is about the famous art form Yakshagana. Yakshagana is a composite form of colorful art intertwined with dance, music, drama, costumes, and makeup making it as the significant folk theatre of Karnataka and Kerala. Kerala and Karnataka are bordering states and shares some common implications. Kasargod is the district in Kerala sharing its borders with Karnataka. Coming under the linguistic region in Tulu Nadu, and close to Karnataka, the district does have some Kannada influences. Even some minority speaks Kannada. Earlier Kasargod was a part of South Canara district and absorbed some of the culture, art, and heritage of the nearby state Karnataka. Kerala shining with its upgraded tourism is attracting people across the country and being nearest and connected by air with Bangalore, more inflow of tourists is observed from Karnataka, specifically Bangalore. To entice them and make their tour comfortable, travel arrangers will create tailor-made tour packages from Bangalore to Kerala. Being a busy city, they come for serene salvation in Kerala by seeking a dip in the unending beauty of Kerala. Watching art forms is another activity all travelers wish to behold but it is a matter of pride to watch your homeland art form in another state. Karnataka is a state with immense colors, famed for its excellent art, rich culture, and heritage. Kerala picked a slice of its unique art form, the Yakshagana, a glimpse of its vibrant culture. Kasargod practices this exorbitant art form by paying due respect. Yakshagana is a composite form of art intertwined with dance, music, drama, costumes, and makeup making it as the significant folk theatre of Karnataka and Kerala. This art form is performed in temple premises and like every art forms, Yaksahgana too is a God worship. Actually, the art forms like Yaksahgana are aimed to spread spiritual awakening and imparting ethical values by making the audience entertained. The act is conducted by performing the stories from great epics like Mahabharata, Ramayana and other mythological episodes. This art form has a direct link with bhakti movement which was conducted to spread spirituality. Take the meaning of its name, Yakshagana, where 'Gana' is the song and 'yaksha' is nature spirits.The medium of performance is commonly in Kannada but performances in Malayalam are also conducted. The performances are usually commenced after the shadows of divine twilight is felt on earth. Once Yaksahagana was performed as a medium of entertainment during monsoon as people are forced to sit indoors. Gaining birth from the womb of Karnataka, Yakshagana is entirely different from the traditional Carnatic music and Hindustani classical style. Typically it is called as Bayalata, the performance played in open air. The Bangalore natives relate their prodigious art form, Yakshagana with the traditional art form of Kerala, Kathakali. Thus they find it interesting to watch Kathakali as the mode of the play is same but still, both the art forms vary in various aspects. 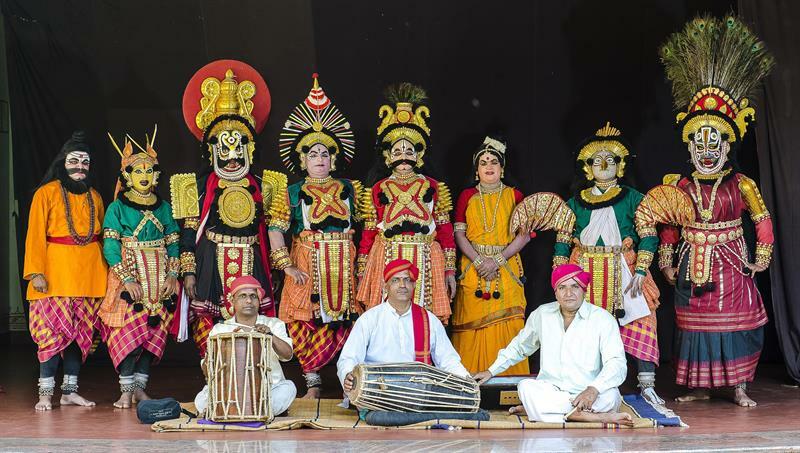 The troup of Yakshagana comprises two groups namely, 'Himmelas', the group of musicians and 'Mummelas' the group of dancers and actors. A rhythmic combination of these vibrant performers is the mindblowing outcome of performing Yakshagana. The performers will act on the stories depicted in epic poems known as Puranas or Kavyas, with musical instruments being the hand drum and pipe along with harmonium. At twilight, with the start of a drum beat, the performance starts and the actors step out with elaborate costumes with head gears and face paints. To transport the audience into a supernatural world, the stagecraft is made alluring with the presence of divinity. The origin of this stupendous art form in Karnataka directs to the Budha- worship which was prevalent in South Canara district. Various other art forms of Kerala were too believed to be descended from this Budha-worship. Theyyam is a great example and is the most popular art forms in Northern Kerala. What influenced Yaksahgana is the Sanskrit drama and folk dance, dancing and acting must go hand in hand to perform this. Speeches and music are also played in between. The performers must be well trained to render the art form. A great pioneer in this field was born in the village of Kumbla in Kasargod, Parthisubha who is known as the father of Yakshagana. Kasargod can take pride in nurturing this brilliant art form. Even Kerala can receive the respect and gratitude from natives of Bangalore, Karnataka for making their mother art form alive.